/Now is the Market Overvalued? Now is the Market Overvalued? On the last day of trading in March of this year, the S&P 500 Index closed at a new all-time high of 1,569 surpassing the previous closing high of 1,565 reached in October of 2007. At this new high in March, the Index was trading at about 13.9 times earnings. * In our March and April Market Commentaries we discussed whether stocks were expensive. In August the S&P 500 had surpassed 1,650, and in our August Market Commentary we discussed the “Rule of 20” and determined that given existing, low-inflationary conditions, stocks offered further upside potential. This chart presents the P/E multiple* for the S&P 500 from 1988 to present. During this 25-year period, the economy has experienced three recessions (boxed areas) and the average P/E* for the entire period is 15.4. So by this historical comparison, the stock market is trading at very close to its 25-year average P/E valuation. It is important to note that the stock market rarely trades at its longer-term average but instead has trended from below the average to above the average (1988 to 1999) and above the average to below the average (1999 to 2011). Consistent with our look at the “Rule of 20” last August, we believe fair valuation needs to be analyzed in the context of existing, low-inflationary conditions. In addition to looking at the rate of growth in the consumer price index, important indicators of inflationary perceptions are overall commodity prices. Rising commodity prices typically bring inflationary concerns and stable or falling commodity prices tend to keep concerns at bay. 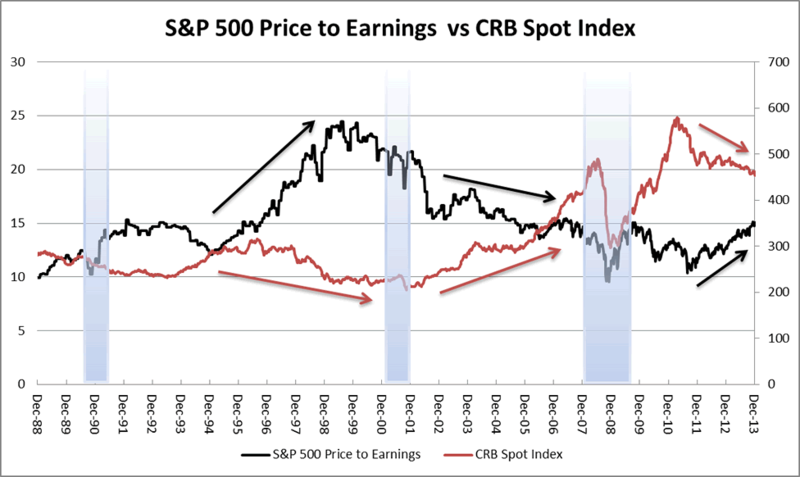 This chart again presents the P/E for the S&P 500 (black line) since 1988 along with the CRB Spot Index (red line). The negative relationship is apparent. From late 1994 to early 2000 commodity prices trended lower and P/Es trended higher. Following the 2001 economic recession, the CRB Spot Index trended higher until 2008 and the P/E for the S&P 500 trended lower. More recently, the commodity index peaked in 2011 and has been trending lower and the market P/E has responded favorably. Will commodity prices continue to trend lower and will P/Es continue to work higher? We think so because the global supply and demand conditions are improving. The persistent rise in the CRB Index from 2002 to 2008 was driven, in our view, by the surging economic growth in the BRIC countries (Brazil, Russia, India and China) and other emerging countries. Driven by accelerating growth in capital oriented investments, these relative young economies provided enough incremental growth to tighten resource markets and push commodity prices higher. Today circumstances in many of these countries are much different. The strong prior growth has resulted in wage related inflationary pressures and overall growth rates are slowing from unsustainably high levels. In our opinion, going forward the BRIC countries (particularly China) will look to slow their economic growth to address the inflationary pressures and rebalance away from over investment. This will likely mean their incremental growth in the coming years will be less and will be reflected in lower incremental commodity demand. At the same time, new drilling technologies (fracking) have led to significant discoveries which are driving strong supply growth in energy related commodities. These new techniques are being developed throughout the United States and will also likely lead to additional discoveries both here and in other countries. Lower incremental demand and higher incremental supplies suggest commodity prices could continue to trend lower and support higher P/Es. Even if commodity prices move sideways, existing P/Es should be sustained and could still move higher. 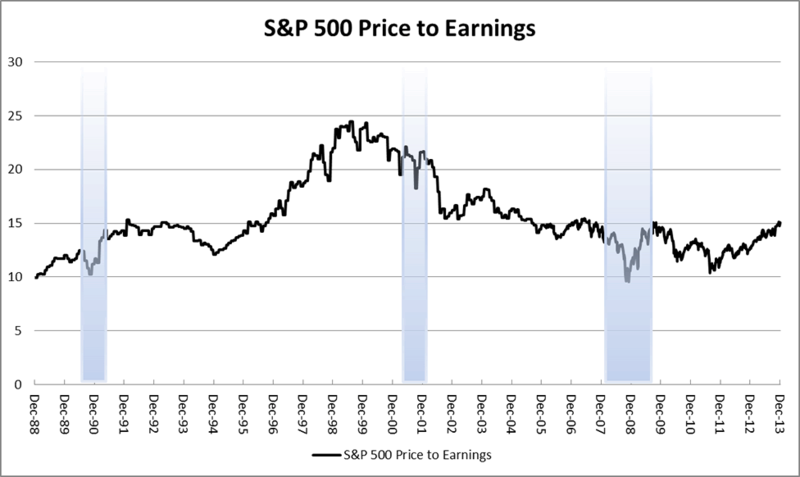 And, if you believe P/Es could move above their long-term average, the market is not overvalued. * Earnings used in the price/earnings ratio are the forward twelve months estimates.